There are two ways to search for an existing incident in the system, using the Search for box or using the Advanced Search function. To search for a single incident, type the incident ID number into the Search for box and then click Go. 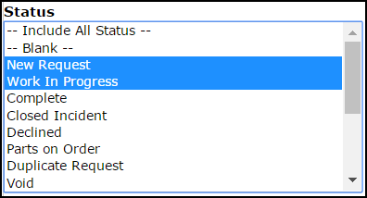 That will pull up the incident form. To search for multiple incidents, click on the Advanced Search link. The Advanced Search allows you to filter for incidents by selecting options in any of the available search fields (Location, Assigned To, Problem Type, etc.). 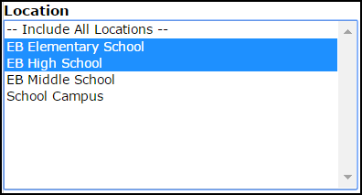 To make a selection, click on an option in the desired field. You will see that option highlighted in blue. To make multiple selections in a single field; make the first selection, hold the CTRL key on your keyboard, and then click on the next selection. Once all of the necessary selections have been made, click on the Search Now button at the bottom of the page. From these search results, you can access a incident by clicking on the incident ID number, you can print an individual incident by clicking on the printer icon next to it, or you can print the entire list as either a PDF or Excel document by using the icons at the bottom of the page.